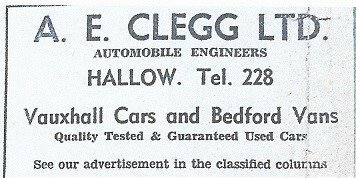 Elgar Business Centre / Hallow Park Business Centre / Braithwaite's Yard / Blacksmith / Builders / Cobbler & Postman / Deans Ices / Driving Instructor / Garages (various) / Onslow Motorcycles / Pearsons Showroom / Greengrocers and Market Gardeners / Post Offices (various) / The Midland Bank / Plumbers & Glaziers inc. House Painting / Sawmill / Wheelwrights. Elgar Business Centre comprises of a number of purpose built units, built on the site of the old sawmills in Moseley Road and owned by Stallards. The units opened in 1993. Only one of the original occupants, Wychbury Engineering, remain but most units are currently occupied. A surprisingly large number of people work from the business park. There are 80 – 100 employees currently working in the site of whom only around 5 are Hallow residents. Most units are currently in use. A notable firm no longer on site is ‘Postcode Anywhere’ which started up there in 2001 with 3 employees but by 2014 with up to 50 employees, outgrew the site and moved to new larger premises in Diglis. Another was ‘Arthur Amos Associates’, a landscape architect’s firm created by a local resident with a long term contract with Sainsbury’s amongst others. The firm operated from there from 2001 until Dec 2014 when it folded. 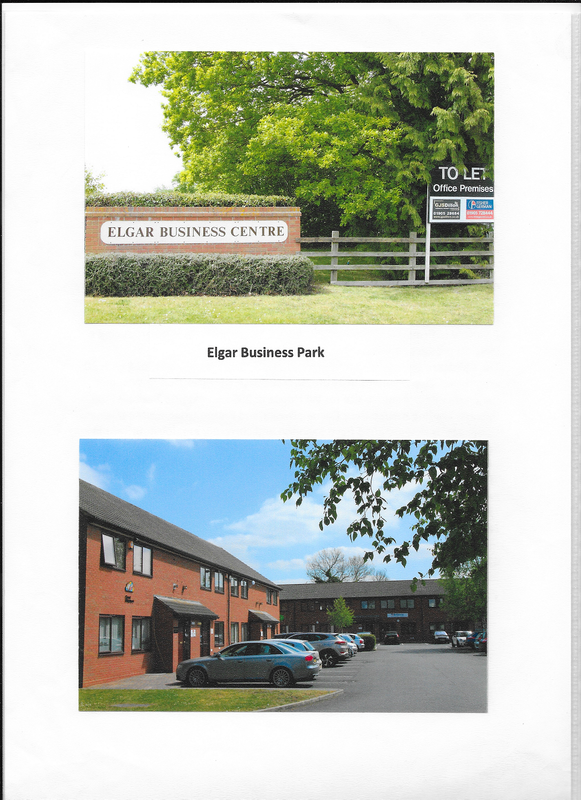 A variety of firms currently work from Elgar Business Park, none producing a physical product on site. 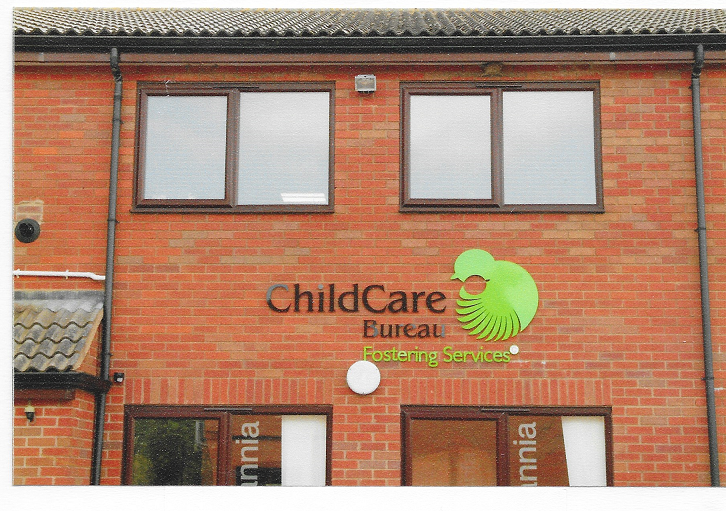 The Childcare Bureau is a fostering service renting 2 units since 2014 with 20 employees. 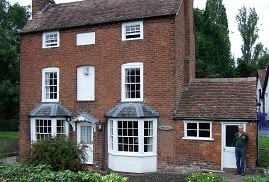 The Women’s Institute, Worcestershire Federation of WIs, quit their valuable city centre site for WI House in 2006, employ 2 people. Their premises include an accessible training room. Parsons Trading moved their Cocoa powder and Freeze Dried Coffee offices to the site in January 2016 from Swindon and currently employ 4. Britannia Site Solutions, with 10 employees, design industrial roofing and cladding for projects such as Asda in Worcester and the new swimming pool in Perdiswell. 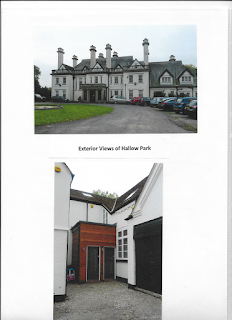 The Hallow based firm Wychbury Engineering, heating contractors previously rented space at Hallow Park but moved to Elgar in1993 with 5 employees. Other firms in occupying units provide services remotely. These include Cloud Shepherd, providers of IT support to businesses, Opus Claims Solutions an Insurance firm, Clearview Systems, a business management consultancy with 11 employees, Microtel Ltd, on site since 2001, provides industrial computer installations and employs 6. Until October 2016 Bridgehouse Property Consultants Ltd operated from Elgar but have recently relocated to Shirley. The hundred year old mansion house, built as a gentleman’s residence, later a children’s home and then a residential school until 1988, is more recently used in part as a business centre. It was sold by Barnardos to Foley Park Estates in December 1988 but is currently owned by Jonathan Hickton of Thorngrove, Grimley. Part of the premises is once more residential and the substantial grounds neglected but inside the building, houses thriving businesses. In the past the upper floor housed offices for Paul Vaughan (PVA management), theatrical and literary agent for a number of well-known writers and performers including local star Chris Tarrant, Larry Grayson, Geof Hamilton and David Icke. Hallow Park was also the headquarters for a double glazing firm and a manufacturer of shell suits. Wychbury Engineering (Heating Contractors) rented 5 rooms between 1990 and 1993 before the firm moved on to Elgar Business Centre. Since 2009 Bishop’s Accountancy Ltd (Chartered Accountants) have managed accounts for a number of firms from four ground floor rooms in Hallow Park, employing six staff. The largest firm currently in the premises is Eclipse Homecare Services. Occupying nine rooms on 2 floors, sixteen staff are employed managing homecare services for the elderly and disabled. Hallow Park is the head office of the service which has branches in Bromsgrove, Tenbury and Stourport with a total staff of around 200. Mrs. Braithwaite, who lived in a bungalow on the Hallow Road, rented out her adjoining land of around 1 ¾ acres to small industries, at very reasonable rents. There were approximately ten units and they were used mainly for storage. The area became known as Braithwaite's Yard. She owned the yard until 2009 when John Tainton bought it. 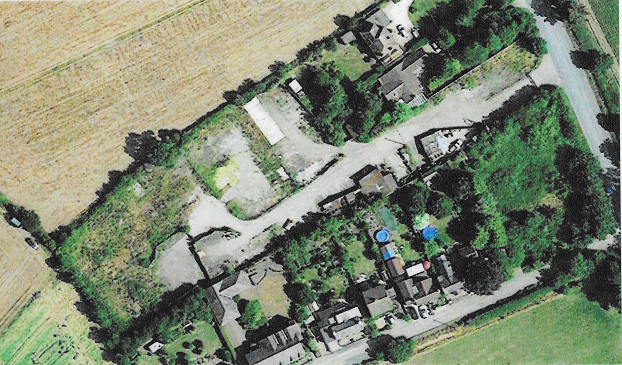 The land has now been cleared with the aim of getting planning permission for housing. June 2014 aged 75. The company has now moved to Fieldridge, Bromyard Road. Burston & Cole (Unit 8) Flat roofing specialists. Beacon Construction Co., trading as 'Beacon of Worcester'. They were involved with sports ground construction, especially tennis courts. Severn Gas Supplies Ltd. (Unit 2) Suppliers of gas including Calor gas. Mobile Tune - car tuning services. 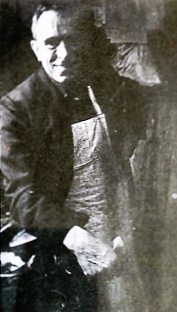 GEORGE YOUNG, the Blacksmith lived and worked in "The Forge" by the Crown. He would let the children watch him shoe horses as long as they were very quiet. People remember the heat and the noise when the blacksmiths were working hard. There was a weighing machine outside the forge. The cottage is still overlooking The Green just past The Crown. 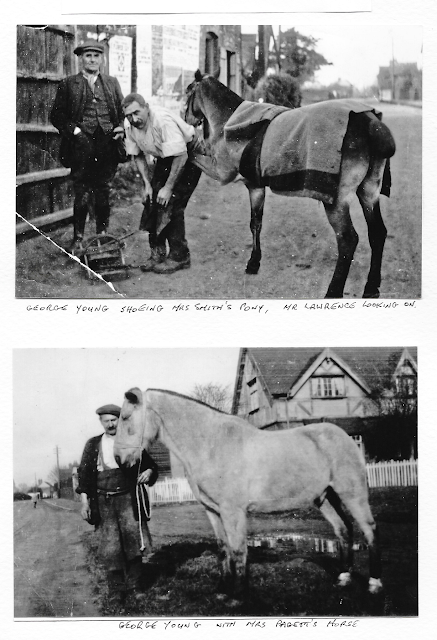 George Young with Mrs. Pagett's horse. BERT ANDREWS & SON LTD.
Again a family concern, formed in 1939 by Kenneth Dolton - existing properties in Hallow that were built by them include those in Browne's Way, Ladygo Stores and bungalows in Oakleigh Avenue. Based in Worcester, the company closed in 2009. 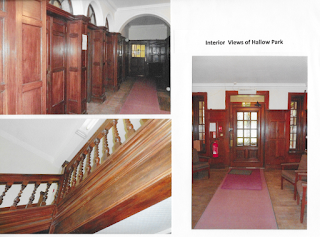 George attended Hallow School until he left to work at Dents Glove factory in Worcester. He then worked for Mr. Jacobs, a shoe repairer who had premises in either Friar Street or New Street, Worcester. (George Jacobs, boot repairer, was listed in Kelly’s Directory 1928, as being at 43 Portland Street, Worcester). George bought Carey Villa, Hallow in either 1948 or 1949 and in 1951, he married Mary nee Carpenter. They had three sons, David, John and Clive. Whilst living with his family at The Haven in Moseley Road, as well as being a part-time postman, George set up a workshop in the garden shed and started to repair shoes. To read more about George's life and work, click here. In 1975, Dean Clarke found temporary employment selling ice-cream for Walls. In 1976, one of the hottest years on record, he bought an old Viva ice-cream van. The freezer was broken and was replaced with a domestic freezer with a split lid. His signature chime was 'Little Brown Jug' which the children loved to dance to. 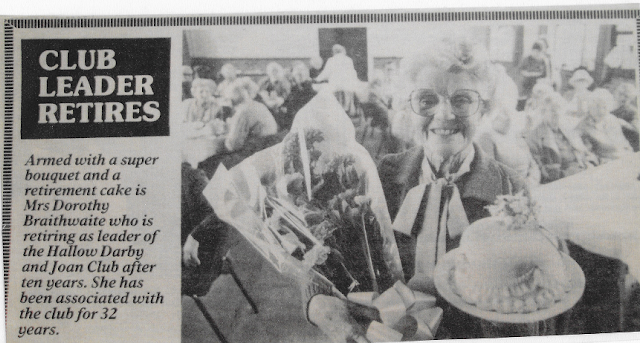 As an independent trader he bought ice-cream from York Jones in Droitwich. He sold ice-creams around the factories in Blackpole, the caravan sites at Holt, and the villages to the north of Worcester. Deans Ices became a family business when Dean married Pat in 1985. Amber and Matt gaining a brother, Hew, who was born in 1986. The business began to develop and expanded into selling at bigger events. The old Viva with its limited capacity was joined by an old Transit Mk1 ice-cream van, decorated inside with pink elephants! This proved that larger vans worked better and were more profitable... but not this old decrepit model; we could not stand the pink elephants! Investing all of his cash (including emptying the kid's money boxes) a more modern transit van was bought and converted. This was painted in Dean's trademake livery which is still to be seen on present vans. At last a good looking and reliable van with a large freezer was in use. 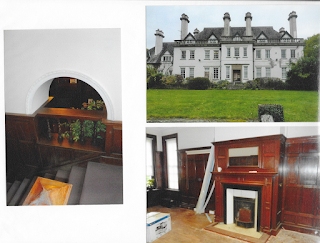 By 1991 with the business continuing to grow and expand, more room was needed so Dean moved 100 yards up to his present home in Parkfield Lane. 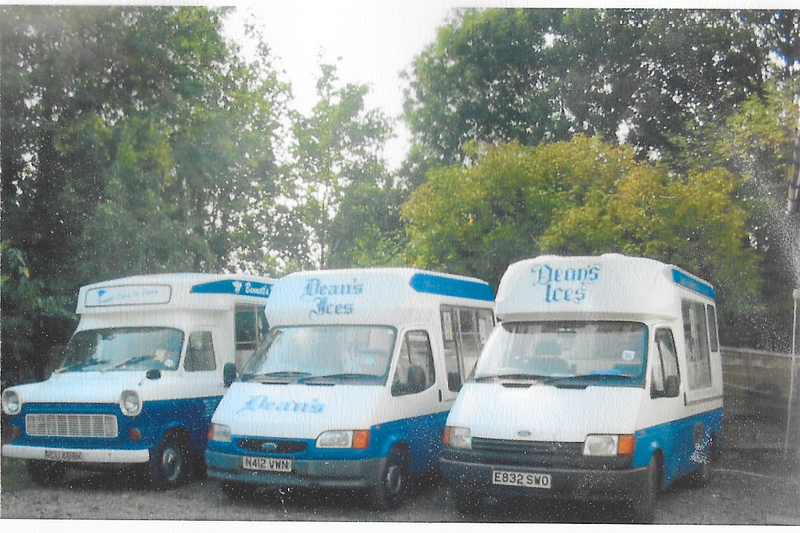 All Dean' children - Amber, Matt and Huw have at some point in their lives been involved in and worked for Deans Ices. Even grandson Josh has been known to scoop a few ice-creams when needed. 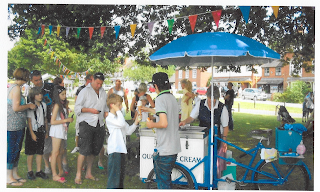 Over 42 years of trading, two major events influenced the development and success of the business - selling ice-cream at the Three Counties Show, and later 14 years at the Worcestershire County Cricket Ground, including the massive 17,000 plus crowd at the Elton John Concert in 2006. 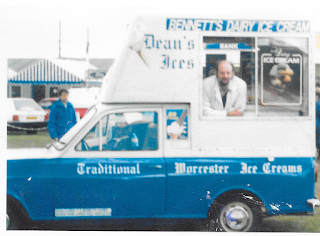 Pop festivals, raves, caravan rallies, dog shows, school fetes and sports days, car boots, weddings, birthday celebrations, horse shows and events, village fetes and family parties have all in some way contributed to the history of Deans Ices. In 2004 Dean purchased a custom built, super deluxe ice-cream van with 2 freezers. It is now known as the 'new van' although it has been in use 13 years. The other van is now known as 'the old van'. 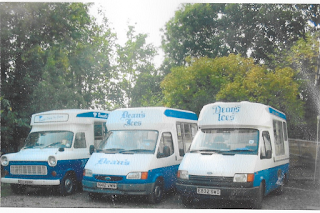 Throughout the 1990s and 2000s, Dean hgas owned and operated 3 ice-cream vans and an ice-cream trailer. At one of the car boot sales in the village, he bought an original 1950/60s ice-cream tricycle. The cost of renovating the tricycle was greater than its actual purchase price, and its not the most practical of units to use, but it is a favourite with the family and the customers. This is a picture of Cecil Ernest Munslow who lived at 22 Heath Close. He was born at 'Paddlebrook, Sinton Green. Having been employed firstly by the British School of Motoring, he ran the ABC School of Motoring from his home. Cecil was the first instructor to give his driving pupils 'homework' in the form of instruction cards. Copies of these are shown below. Cecil was married to Olive Stokes for a short time and they had a son, Peter who is now living in Canada. Cecil then married Olive Hunt (of Lechmere Crescent, Hallow Road) in 1948. They had two daughters who are both now living in this area. A garage that has been in the village for about 88 years and has remained in the same family to this day. 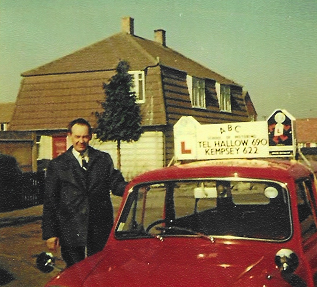 Ted Clegg together with his wife Kate, who eventually became Chairman, started the business with a small garage on The Green in front of Pinch Cottage in 1929. He repaired and sold motorbikes and bicycles and eventually cars. Ice-creams, poop and paraffin was also sold. The business then moved to the site still occupied on the Main Road, Hallow. Apart from petrol, they also had a shop which later became the Post Office. Later their son, Neville and daughter, Pat joined the business and Pat’s son Nick also worked with them. They won a General Motors Dealership in 1959. 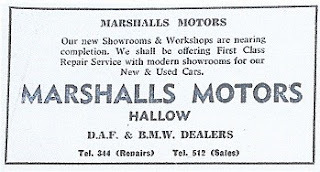 They not only sold cars but also offered after-sales care and servicing which has continued to grow with the business to this day. This garage was on the corner of Moseley Road and Main Road, Hallow (Moseley Turning). It was run by Mr. Tom Davis and his son John. It was originally a black and white cottage with two petrol pumps. The house was later knocked down and the more modern building was built. The business was taken over by Mr. Patterson in the 1950s. In the old building, people remember a shop selling tobacco and sweets. The new build sold fuel and used cars, but eventually was only for car maintenance (1950- c. 1998). There are now new houses and flats on the site. 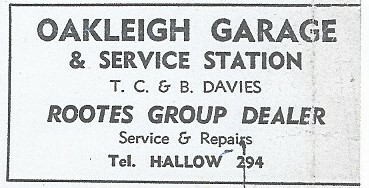 "The site on the corner of Moseley Road and d the main Worcester-Holt road in the village of Hallow is now occupied by housing, but for many years it was home to Oakleigh Garage run by the Davis family. A typical Worcester village garage, it has now gone the way of many others since supermarkets started selling fuel. Back in 1980, when this photo was taken, there was not a diesel pump in sight. There would have been one, but it was mostly only used by tradesmen’s trucks and vans and often stood on its own. Petrol came in two grades, two star (92 octane) and four star (98 octane), both leaded. Also, don’t be confused by the price. It’s per gallon. Converted into today’s price per litre it would be around 30p. But that was before two Gulf wars." 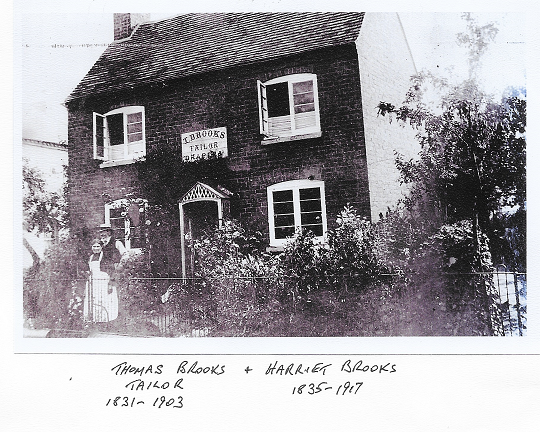 Between The Royal Oak (which was situated on the corner of Main Road and Broadheath Lane) and Archbell Cottages was a general store with a petrol pump that was owned by M. & Mrs. Jenkins. They sold fuel and charged accumulators. The general store was also a lending library, a farthing per book! Mr. Teale took over the business. Len Onslow also had his workshop here, where he made the famous S.O.S. 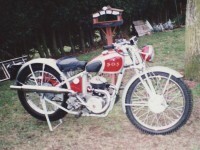 (Super Onslow Special motorbikes). Mr. Len Taylor of Hallow still owns one and often takes it to displays at Shows. The building has since been a Funeral Directors, and now is a carpet store/sale room. This is run by The House Doctor, a company who offer many skills for all areas of house and building repairs, inside or out. Pearsons was, until 1985, part of the Black & White Group of companies. 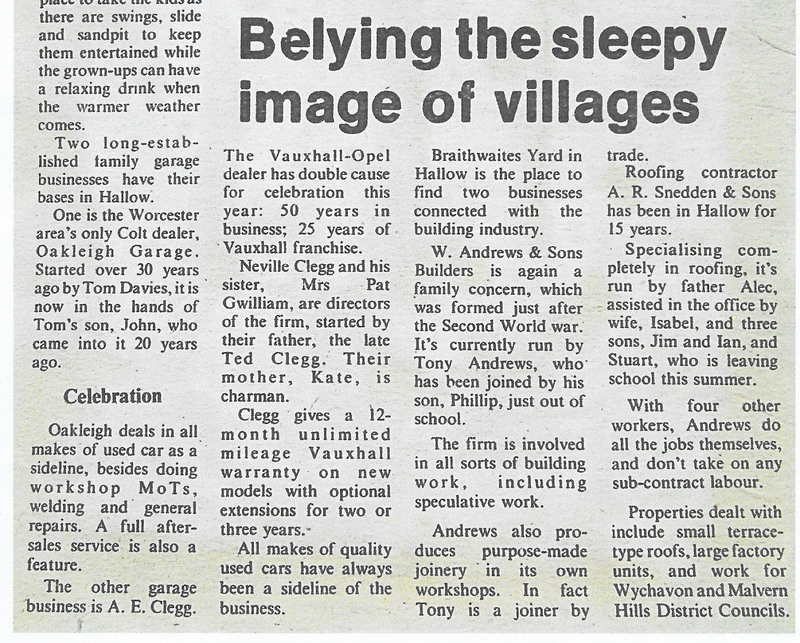 In March of that year the family –owned group de-merged and Brenda Pearson, daughter of the founder, took over the Hallow based garage next to The Crown, and the name became B & B Pearson Ltd. Brenda’s husband, Ben continued to be responsible for the management of the garage. This was refurbished and fitted out with all the latest workshop equipment, and together with Audi Volkswagen, they maintained high standards of sales and customer care. The garage has remained a dealership with a variety of car brands and is now Motorline Hyundai. Once owned by the Thorpe's, and now the Green family. PARKFIELD NURSERIES (previously owned by Mrs. Wheeley Lea, and also The Lock Family, and the Redwoods. To view the research on all the above, please click here. Richard Oakley was the post master and letters arrived from Worcester at 7.55 a.m. and dispatched from Hallow at 5.20 p.m. The nearest money orders and telegraph offices were Ombersley and Worcester. It was run by Mark Young who was a blacksmith as well as the post master. Situated at the Old Smithy on the main road. 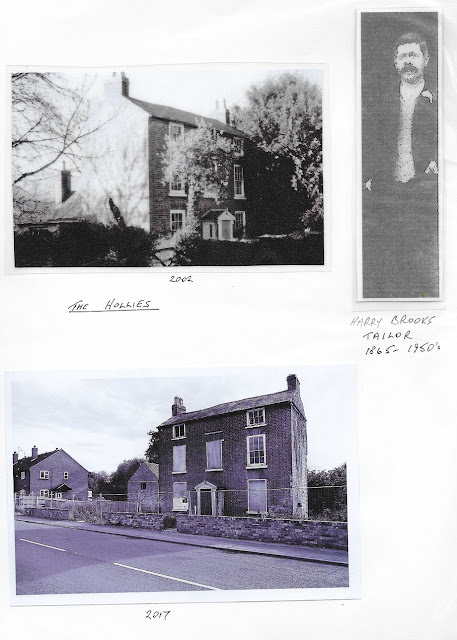 The post office was run by Patty Lane and family, and situated in the Post House on Hallow Green. It transferred to the Thatched Cottage opposite the Crown Inn, and Mr. & Mrs. Bonner were the postmasters. When they retired the Cleggs took over. 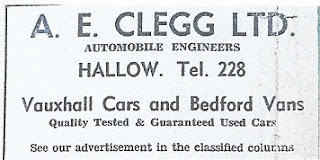 In 1929, Ray Clegg’s father had opened a garage facing onto Hallow Green, with two petrol pumps, latterly moving to the present premises on the main road in 1936. The post office was moved to the building to the left of the garage. Mrs. Kate Clegg was postmistress for 21 years, passing it on to her daughter Mrs. Pat Gwilliam. Mrs. Handley who ran the general stores and papers at Oakleigh Avenue took over as post mistress and the post office has been there until the present day. Mrs. Badger ran the post office during World War II. Mr. & Mrs. Clarke from Pensax were the post masters, followed by R. & J. Evans, Brian and Glenda Davidge, and finally Mr. & Mrs. Cooksey, who are there at present. The Midland Bank was once resident in the Old School House, adjacent to the school. Spilsbury Cottage on Hallow Green, previously known as “The Cottage”, as rented for over 40 years by a plumber, John Harrison Clay who also traded as a glazier, painter and paperhanger. For many years there was a sign above the door at Spilsbury. Moseley Sawmills (now the site of Elgar Business Park) on 'Four Acres' Moseley, Hallow was in operation from 1926 until around 1986. Horace Winders, owner of the sawmills, was born in Broadheath in 1900 to the farming family of nearby Salways Farm. The majority of the land for the sawmills was sold to Horace by his father. Horace built the six nearby houses for his family and workers. The sawmill specialised in veneers, particularly of oak, walnut, yew and ash. Horace was considered a great judge of standing timber. He suffered a serious motorbike accident so was driven around the country to select wood for the mill. Margaret, his secretary and driver from 1955 became his second wife in 1989, only a year before his death. 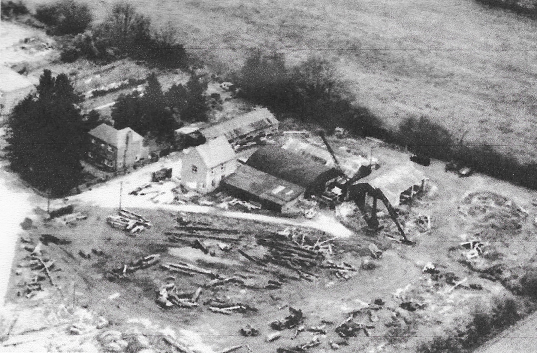 The sawmill was let out, later sold to Jenkins and Hayes, then to Mr. Sten Harrison who applied for planning permission to build offices on the site in 1986. Elgar Business Park was built in 1990. 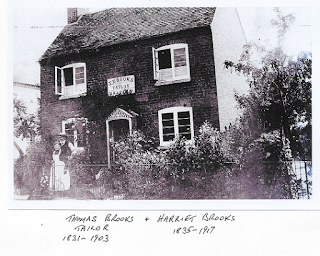 Thomas Brooks, born in Holt on 17th July 1831, was a tailor all of his life. He had worked his apprenticeship in Grimley with a man called James Bishop. By 1861 aged 30, he had moved to Hallow and he was a Master Tailor. By 1871 he called himself a Tailor and Draper. He and his wife, Harriet lived at Clematis Cottage, near Heath Cottages and they had seven children, one of whom, Frederick died, having drowned at the Camp when he was 8 years old. Thomas worked right into his 70s and he taught his craft to his son, Harry and his two daughters, Fanny and Emily Kate. Fanny and Emily were to change their careers during their lifetimes but Harry was to carry on the family name and grow a very creditable business. Harry was born in 1866. He moved to York when he was in his 20s and he worked as a tailor here. His wife, Harriet had a baby girl, May, whilst they were living in York. The family moved back to Hallow and had two further children. They lived in Jessamine Cottage. Harry was working for himself at home. By 1911 the family had moved to “The Hollies” where Harry continued to work from home. May was aged 18 by this time and she was assisting at home in the business. Harry advertised in the trade directories and by 1921 he describes himself as a tailor and Assistant Overseer. He was still advertising his services in 1932 when he was 67 years old. Like his father before him, he carried on working into his old age.